Cancer is a transnational condition involving the unprecedented flow of health information, technologies, and people across national borders. Such movement raises questions about the nature of therapeutic citizenship, how and where structurally vulnerable populations obtain care, and the political geography of blame associated with this disease. This volume brings together cutting-edge anthropological research carried out across North and South America, Europe, Africa and Asia, representing low-, middle- and high-resource countries with a diversity of national health care systems. Contributors ethnographically map the varied nature of cancer experiences and articulate the multiplicity of meanings that survivorship, risk, charity and care entail. They explore institutional frameworks shaping local responses to cancer and underlying political forces and structural variables that frame individual experiences. Of particular concern is the need to interrogate underlying assumptions of research designs that may lead to the naturalizing of hidden agendas or intentions. 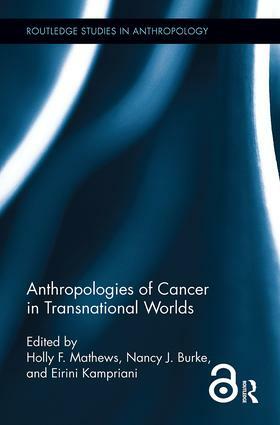 Running throughout the chapters, moreover, are considerations of moral and ethical issues related to cancer treatment and research. Thematic emphases include the importance of local biologies in the framing of cancer diagnosis and treatment protocols, uncertainty and ambiguity in definitions of biosociality, shifting definitions of patienthood, and the sociality of care and support. Chapter 3 of this book is freely available as a downloadable Open Access PDF at www.tandfebooks.com/openaccess. It has been made available under a Creative Commons Attribution-Non Commercial-No Derivatives 3.0 license.